The first Tuesday night of November sees a brand-new review on SuperPhillip Central. It's for a sequel of a game that originally did not appear on a Nintendo platform, yet the sequel is a Wii U exclusive. It's Stealth Inc. 2: A Game of Clones. If you remember how it was with the Nintendo 3DS eShop, that service started out eerily similar to the Wii U eShop. Both launched with very few games, and it would take a long stretch of time before content would come on a frequent basis. Not just content, but GOOD content. It seems we've hit that stage where the Wii U eShop has finally hit its stride, and what was once a multi-platform series is now seeing its sequel debut as an exclusive for the digital storefront. 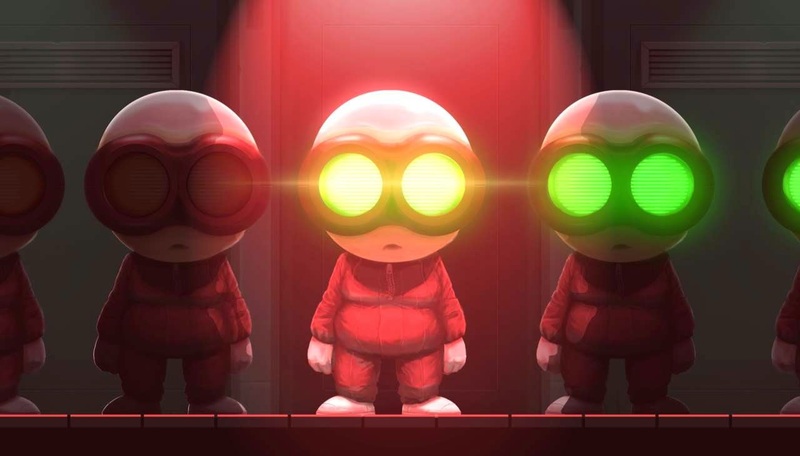 Stealth Inc. 2: A Game of Clones has sneaked its way onto the Wii U eShop. Should you alert your wallet? 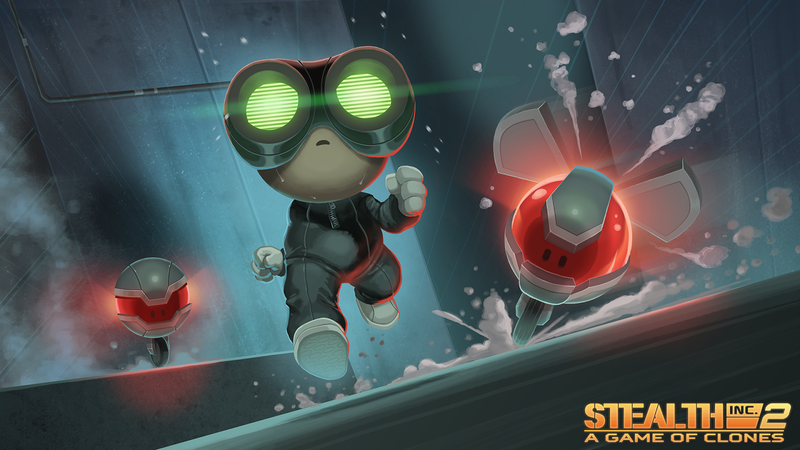 In Stealth Inc. 2 you play as a cute, little, chubby clone whose biggest features are a potbelly and pair of goggles, who recently escaped from a routine shutdown procedure, much to the chagrin of an employee obsessed with being top dog of his company. This mastermind wishes for your failure at every turn, mocking you and taunting you at every step of the way. This isn't done with voice work, but instead with text ingeniously displayed on the game levels' walls in a way that blends in well to the environments and doesn't stick out like a sore thumb, either. Unfortunately, the cutscenes that show off the biggest events of the story don't impress as much, being pretty ho-hum still-frame pictures with incredibly limited animation. Regardless, the tale is endearing even without a big budget given to something as unimportant to a game like this than cutscenes. 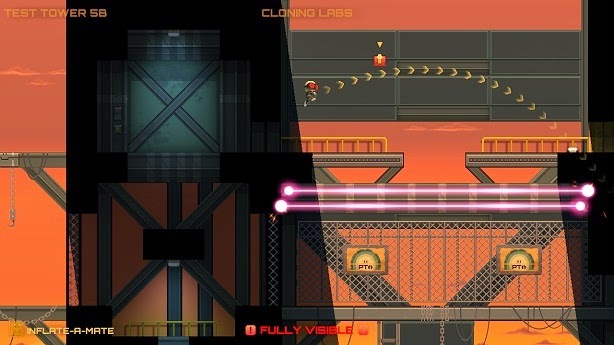 The main attraction to Stealth Inc. 2 is the game's various test chambers. These have you taking a multitude of skills, whether they be reflexes, timing, platforming precision, and brain-busting, and solving puzzles to reach the exit of each chamber. Your tubby robotic clone has a limited move set available to it. It can jump, crotch and crawl, and hang from ledges. It can also interact with computer terminals, buttons, and switches. However, as you'll find out through playing the first set of levels, the game tosses in enough variety and challenges and continues at a steady pace to keep things fresh and engaging. It also keeps things rather difficult. As the title of the game suggests ever-so-subtly (sarcastically said), Stealth Inc. 2's gameplay deals a lot with stealth. It's all about avoiding detection from enemies who will quickly destroy you upon sight. No worries if you're destroyed, as you're nine times out of ten placed back near where you died, though that one time where you have to redo a whole section can be really, really annoying. There's some insanely clever puzzle platforming action to be found in Stealth Inc. 2. One test chamber required me to have a vent blow some steam into a camera's sight, obstructing its vision so my tubby little dude could sneak past undetected. Light is also a major factor, requiring your robotic avatar to stay in the shadows to avoid being seen and using the environment to cast shadows that can hide your robot's presence. Stealth Inc. 2 is all about learning from mistakes to come to the correct solution, and finding the right solution on your own is so darn gratifying! Each test chamber is timed, and players' times are posted on individual online leaderboards on a per-level basis. It takes some great response time, memory, and skills to perfectly run through the later test chambers, especially if you're going for an "S" ranking. An "S" ranking requires an insanely fast time, no deaths, and no detection from enemies or cameras. Since later test chambers are so long and involved, it's easy to just say "forget it" and just run through the game, perhaps only being concerned with time. The most brilliant part of Stealth Inc. 2's design is an old adage of game development that the developers here have gotten down well-- showing the player through doing instead of simply through telling. Stealth Inc. 2 has you trying out solutions through experimentation, rather than through an out-of-place tutorial dictated by the developers. Additionally, Stealth Inc. 2 does a tremendous job at slowly yet steadily building upon your tool set of skills each level. It provides a small amount of knowledge for the player, but just enough that the player can experiment a fair amount to reach a solution to a given puzzle and test chamber. Part of this is done through how each set of test chambers besides the first puts a different gadget of your clone to use. The second set of chambers puts to use the Inflate-a-Mate, a gadget that can weigh down buttons, give you some extra elevation, a means to block lasers, and more. Then there's the Jack Boy, a gadget that allows you to hack nearby enemies, fully controlling them with the right analog stick as you move around with the left. Each chamber layers the uses of each gadget well enough that you're constantly learning and creating different ways of using each gadget. Stealth Inc. 2 employs a Metroid-style overworld, unlike the multi-platform original, which simply had a menu containing every test chamber. For those unaware, what I mean by "a Metroid-style overworld" is one where you earn new gadgets for use outside of the test chambers, making it so you are able to use them to reach previously inaccessible locations. Most of these locations are for progressing in the game and venturing to new sections of the complex for new test chambers, but others house collectible costumes that can be used to customize your clone. Confusingly, there doesn't seem to be anyway to revert your clone back to its generic self once a costume piece has been equipped. Regardless, that's a minor quip with this otherwise excellent game. Although, one big quip concerning the overworld doesn't occur often, but it can be obnoxious nonetheless. Sometimes a missed jump or a botched choice of direction can result in having to redo an entire section of the overworld map. This is an unnecessary punishment for such an easy mistake, making retreading ground unintentionally an annoying happenstance. Stealth Inc. 2 comes with a really cool level creator that pretty much allows players to use the exact same toolkit that the developers of the game used to design their own trials to share with other players online. In essence, there can be an unlimited amount of levels for players to enjoy. That is, of course, as expected with any new tool, you take the time to learn the ins and outs of the level creator. (Unlike the actual game, a tutorial here would have been most welcome!) Regardless, you start off with an empty grid, setting the size of your personalized test chamber, and then select from a bevy of tools, structures, and obstacles to create a (hopefully) engaging and fair challenge for other players to (also hopefully) enjoy. 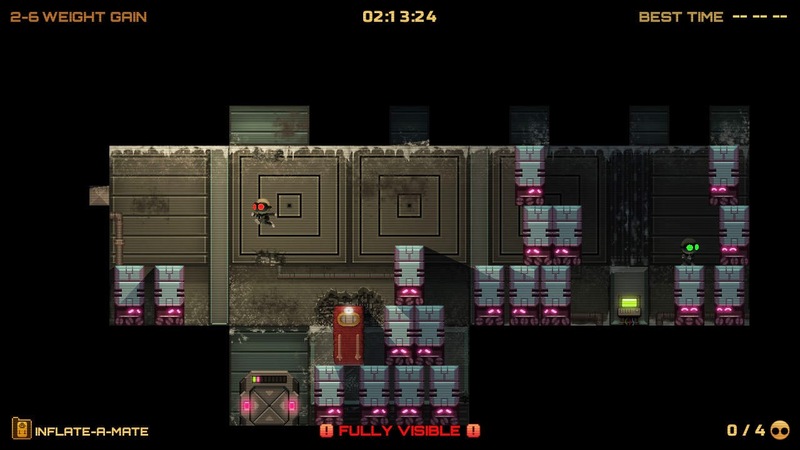 Stealth Inc. 2: A Game of Clones is a spectacular puzzle platformer and a great "get" for the Wii U eShop. It's not just a terrific game all to its own, but it's one of the online store's most competent and satisfying titles to date. Yes, it's not for all, as those with little patience will find constantly retrying levels to be tiresome, but everyone else will find a game packed with puzzles, precision platforming, twitch gameplay, and a robust level creator. Stealth Inc. 2 is a brilliant puzzle platforming package, and it's one that most Wii U owners shouldn't do without.